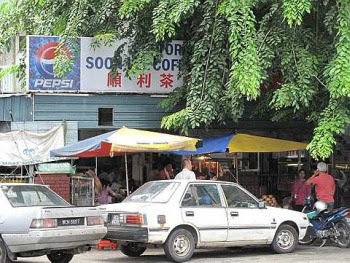 Remember the time when I posted on a coffeeshop in PJ Old Town with good Hakka "lui cha"? This time, at the same coffeeshop, I discovered another gem - a good plate of grilled lamb chops from Freddy's Western Section! Oolala...cheap & good, I would say. I found out about this "pow-wow" western food stall thanks to Cumi & Ciki's post. The sides for the grilled lamb chops aren't fantastic, but the lamb is good :D The best part - 1 serving comes with 2 pieces of lamb chops! You can basically get a good plate of breakfast set(s) for RM5.00/serving (it's considered CHEAP for a generous portion of food...you can refer to Cumi & Ciki's post), chicken/pork/lamb/beef chops/steaks, or even pasta! Woots! All within RM20.00...and below! So if you're hungry and do not want to spend too much for a good plate of western food, this place is quite a good option :) You'll have to try it out for yourself to judge! This will be a short post! :D Just an announcement to make: If you haven't had any idea on where to celebrate Father's Day tomorrow, head over to Nihonkai at Sunway Mentari! It'll be a good treat, especially if your dad/family enjoys Japanese food :) You'll also get a 20% discount if you order the Parent's Day Special set! To all fathers, fathers-to-be, grandfathers & mentor-fathers, have a blessed Father's Day! Here's introducing my 15th-batch of baked babies, Oatmeal, Apricots, & Almonds Breakfast Muffin! More fibre, more nutritious! It pops up & also cracks open like a muffin that you get at the stores! *hurray* Another success story! I'll taste it tomorrow for breakfast to see if my muffins taste as good as it looks! After some research, I ended up using the recipe from www.hillbillyhousewife.com because it looks easy, convincing, & I have all the ingredients required in the recipe! Simple justification on why I ended up using this recipe of all the many recipes out there, eh? 1. Preheat oven at 200 degrees (C)/ 400 degrees (F). 2. In a large bowl combine the oatmeal and buttermilk or sour milk. Let it stand for a few minutes, for the oatmeal to absorb some of the buttermilk. 3. Add the egg, sugar and oil. Beat very well with a wire whisk. 4. Add the flour, baking soda, salt and baking powder. Mix again, until all of the dry particles are moistened. Do not over beat. It should only take about a 20 or 30 strokes by hand to mix it up enough. 5. Add the apricots & almonds. Mix well without over-mixing. 6. Spoon the batter into a dozen well oiled muffin cups. Note: The batter will look REALLY thick, also because of the oats. It's supposed to be a "drier" sort of muffin instead of a moist one. 7. Bake at 400 degrees for about 20-25 minutes. 8. Insert a toothpick into the muffins. If the toothpick comes out clean, the muffins are done. 9. Remove from oven & place on cooling rack. 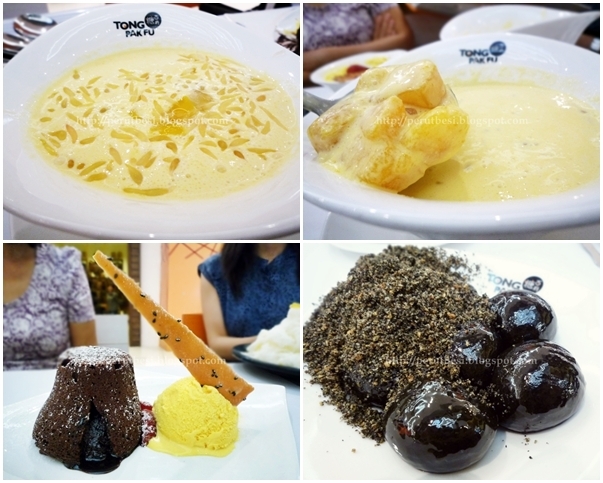 Overall comment: Lovely-tasting hot & cold desserts that uses the best of ingredients to get the best of flavours to tickle your tastebuds. Halal: Not yet. They're in the final stages of obtaining halal certification. For now, it's pork-free! 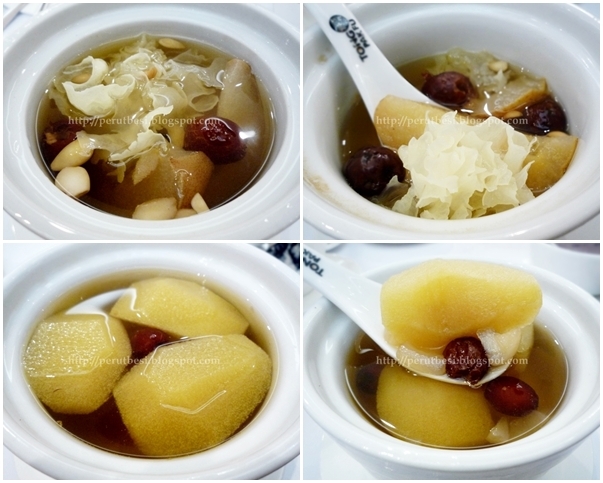 Who doesn't like some smooth, cool, dessert - especially on such a hot spell that we're experiencing, here in Klang Valley! I certainly wouldn't mind indulging in some good desserts (although I admit I don't really have a sweet tooth)! With the competitive desserts market that spoils everyone of us with an extensive variety of choice, one would really appreciate knowing which is the better & more worth-eating dessert in town. 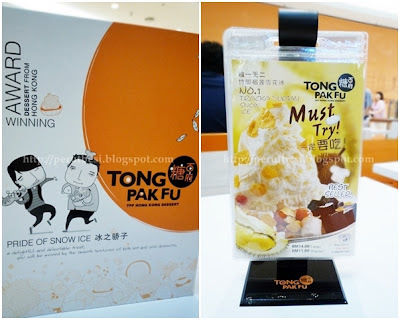 Tong Pak Fu is one of the latest players in the dessert arena in Malaysia. 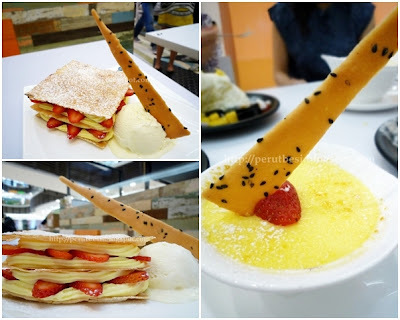 It offers quality & delectable desserts that will make you crave for more :) However, I personally find the prices quite steep for desserts - most desserts are more expensive than a bowl of noodles these days! I take comfort for the fact that I'll be paying for desserts that are low/zero in colouring & preservatives. I enjoyed the pink guava one best. It's refreshing, light, & unique. The condiments that come with the pink guava snow ice are also very special. The smallest balls are crunchy, while the larger ones have liquid that burst in your mouth when you bite into it :) The tracka durian snow ice is also quite special. 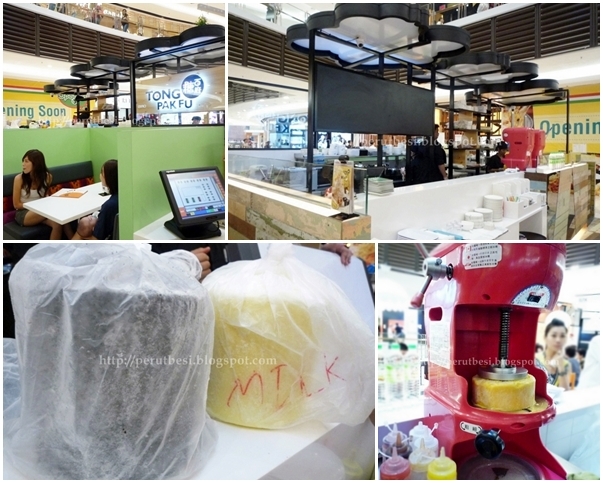 It uses the "Chuk Kiok" variant of durian, which gives a more aromatic flavour to the snow ice. 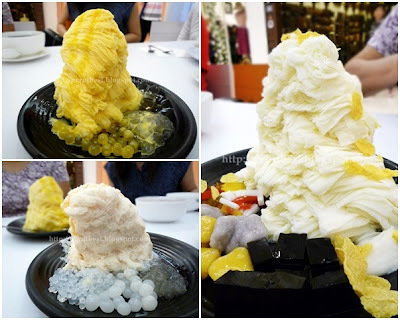 Compared to the other variant available, the D24 Durian Snow Ice, this one would be more aromatic. When: in the year 2008. Since it began, this brand has been a well-known dessert brand in Hong Kong & even in Malaysia now. Tong Pak Fu when literally translated means "Sugar-Hundred-Mansion" or "House of Sweet". This dessert place serves an array of hot & cold desserts, plus some Hong Kong street snacks as well. It's good for irritated throats & highly nutritious. Snow fungus is said to improve blood circulation, increase metabolism, whiten & moisturise the skin. If you need a healthy dose of dessert & you're too occupied to take the trouble to prepare it yourself, you can go for this home-boiled dessert look-&-taste-alike :) Pamper yourself! I personally felt that the mango sago crème should be more "chilled". It's a little difficult to finish the whole serving by yourself since it's so thick & creamy. The serving is also quite large (do not be fooled by the photo below as it has been resized!). 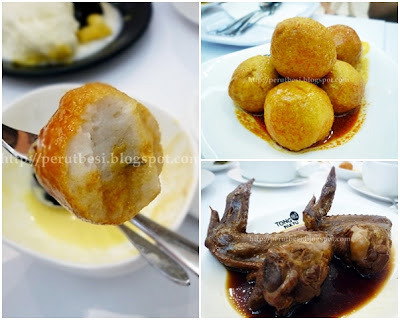 The glutinous rice balls were fragrant & you'll love it if you're a fan of black sesame & peanuts. I felt the chocolate lava cake could be better. Somehow the cake wasn't crispy-on-the-outside-soft-on-the-inside enough & the chocolate sauce was also not liquidish enough. 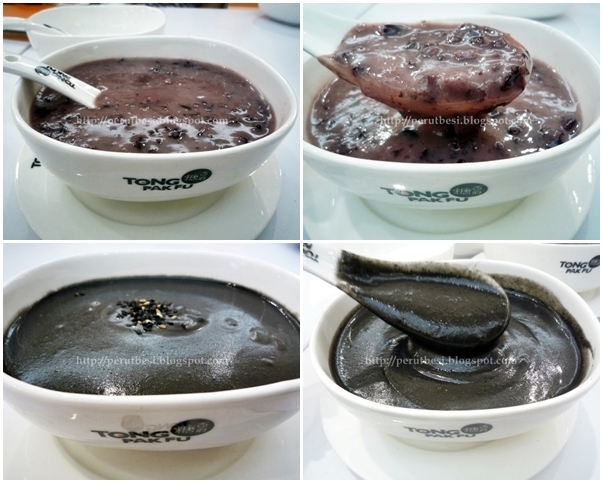 I reckon Tong Pak Fu does best in their Hong Kong desserts & not so much in their Western ones. Seven outlets & more to come! 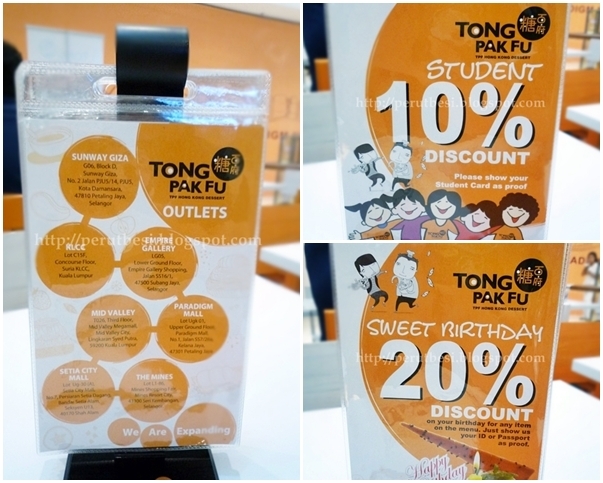 If you're a student or if it's your birthday, Tong Pak Fu has special discounts for you! Each time I pass by Tong Pak Fu, it's sure to be full. So do go earlier in the day to avoid disappointment! They may run out of certain best-sellers if you go at night! Change took place few weeks ago when I was introduced to the Hakka "lui cha" rice dish at PJ old town, a stall in the coffeeshop behind the huge Jin Xuan Hong Kong Dim Sum restaurant. It was lovely! I must say that this dish is still very much an acquired taste, but as my church member said, "This is the best Hakka "lui cha" in town. Other places do not have such tasty ones!" Note: Opens for breakfast & lunch only. Somehow I can't really explain why this Hakka "lui cha" is better than many out there. I reckon it's the taste of the individual ingredients that she places into the bowl of steaming hot rice. Each different vegetable/ingredient are either stir-fried 'til fragrant or fried 'til aromatic. The "green soup" has a pleasant mint leaves fragrance (you can taste that it's reall fresh! ), but the soup wasn't salty or totally flat in taste. There's just something about the rice & soup that makes this dish so popular at this coffeeshop that it often runs out of rice & ingredients if you're there later! Overall comment: Interestingly delicious fish head noodles, which isn't very "fishy" (salmon tends to have a stronger "fishy" smell). The soup base was appetizing & well-balanced in taste. Yums! Affordable too! If you're a fan of salmon & fish head noodles, this is one pretty good place to enjoy the best of both the fish & the noodles. Slightly thick rice vermicelli served in a bowl of milky soup with fragrant Chinese cooking wine ("Fa Thiu Sui Heng Zhao"), tomatoes, ginger, salted vegetables, spring onions, parsley & fried shallots just made my day! It's SO fragrant! Slightly sourish, slightly "fishy", slightly peppery, slightly pungent with alcohol/cooking wine, slightly salty, slightly sweet, slightly spicy (if you eat with the chili paste)...and smooth! - an explosion of flavours in your mouth! Such joy! 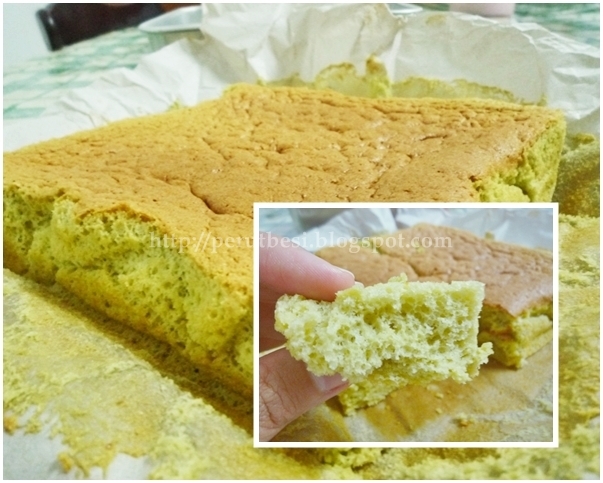 :D I love chiffon cakes & to actually bake some myself & do to so SUCCESSFULLY makes the "cake-eating" even more satisfying! I referred to the recipe by myfoodtrail.com. It looks like one of the "simpler" recipe that does not require cake flour, which I do not have at this point of time. 2. Beat egg whites until foamy, after which gradually add the sugar (125g) while the mixer is still beating. Continue beating until the mixture reaches stiff peaks (you can turn the bowl over without the mixture dropping/flowing out). This will take roughly 5 minutes or more. Set mixture aside. 3. In a small bowl, mix Set B together. 4. In a separate bowl, beat Set A until pale & creamy (it should look roughly tripled in size). This will also take roughly 5 minutes or more. 5. Add Set B slowly into the Set A mixture while beating at low speed. Beat until both sets are well mixed & stop the mixer. 6. Sift Set C into the Set A + Set B mixture, gently folding Set C in to combine. 7. Add 1/3 of the egg white mixture into the green mixture & fold to loosen up the batter. You need not be too gentle at this stage. 8. Add the remaining egg white mixture & fold it in extra gently so that the batter will not deflate. 9. Pour the batter onto an ungreased ring tin & give it some sharp bangs on the table to help the air bubbles get to the top. You can then smoothen the top with a spoon (if needed). Just don't over bang, else you may not get a spongey chiffon cake! Tip from myfoodtrail.com: If the top browns too quickly, put some aluminium foil over the top. 11. Once done, remove cake from oven & let it cool at the cooling rack/table (that's what I usually do). Note: myfoodtrail.com's version - Once out of the oven, immediately invert the cake while still in the tin onto a wire rack and cool completely in the tin. It is best to use a sharp serrated knife to cut the cake as it will be very soft.